With the trend of incorporating pets into everyday activities, it only makes sense to be able to bring your dog to the ballgame. Baseball games are a great way to have a family-friendly outing – why exclude an integral member of the family from participating? 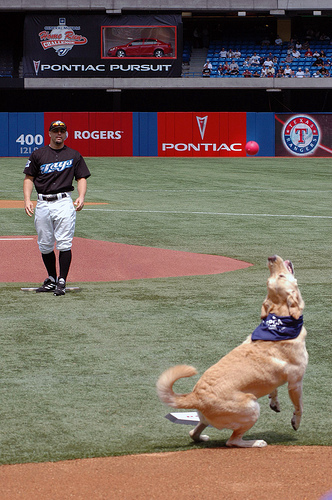 The first instance of a bring-your-dog-to-the-ballpark-day was in August of 1996. The forward-thinking Chicago White Sox held a promotion called the “Dog Days of Summer.” It allowed fans to bring their canine companions and sit in the bleachers of New Comiskey Park. It quickly sold out and sold out well in advance of the season every year since then. 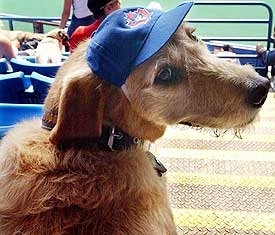 The Montreal Expos got in on the dog-themed promotion in 1998 at Olympic Stadium, and the Minnesota Twins followed suit. Approximately 16 teams take part in the promotion, with the Pittsburgh Pirates having had up to eight dog days in any given season. 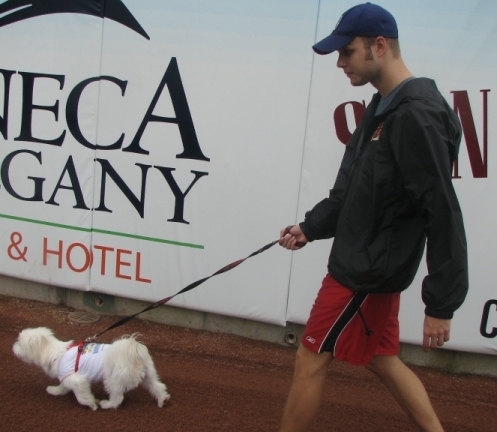 Today, bring-your-dog-to-the-ballpark promotions have become as common as fireworks and bobbleheads as a means to draw fans to baseball games. 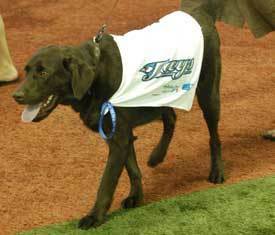 The Toronto Blue Jays began the practice of allowing dogs to attend a single game each season in 2003. Dog owners had to sign a waiver that stated their dog was in good health and that the owner of the dog would assume all responsibility for any damages that may incur during the game. An hour before game time, owners and their dogs were allowed to join a pre-game parade on the field with members of the Blue Jays organization and their dogs. Following the parade, dog owners and their companions were seated in the “Dog Zone” – a specific section in the level 100 outfield. The best part? The funds raised from the Dog Day promotion were donated to the Ontario SPCA to support their lifesaving work, which includes rescue, rehabilitation, and adoption services for the countless animals that come into their shelters in need of care and hope every year. For some inexplicable reason, the promotion quietly discontinued following the 2010 season. You are no longer able to bring your dog to a Blue Jays game. 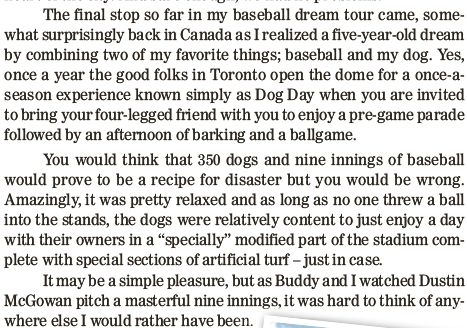 Hopefully this is something that Blue Jays President Mark Shapiro can remedy by incorporating a permanent dog section in his plan to renovate the Rogers Centre. Is that too much to ask? 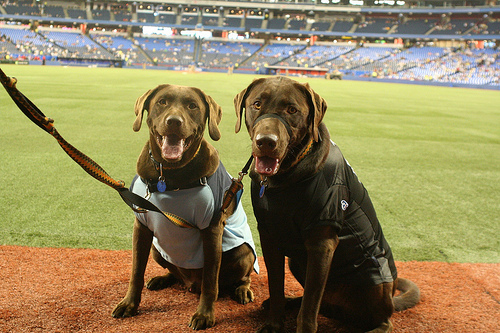 Like the Blue Jays’ Dog Day, most other dog days include the opportunity for dogs to take their owner-fans on the field, with doggy treat bags and special grass areas for rest breaks included. Season ticket owners who aren’t down with dogs are offered alternative seating for the game. At San Diego’s Petco Park, up to 500 dogs are accommodated in their annual Dog Day promotion, which includes a pre-game “Tail” Gate party. While the Chicago Cubs don’t allow dogs in Wrigley Field, fans have the option of taking their dogs to “Wiggly” Field – a dog park not far from the Cubs’ home. For a Dog Day promotion in Detroit, the Tigers brought Milt Wilcox, a former pitcher from the 1984 World Series team who has a black lab named Sparky, onto the field to entertain the crowd with agility-based tricks. Sparky the black lab is, of course, named after former Detroit manager Sparky Anderson. There is some red tape that the dogs must pass through before being admitted to the ballpark. Dogs generally must be a minimum of six months old to attend the ballgame. Also, owners must present a copy of their dog’s current vaccinations from a licensed veterinarian before the game or admittance will be denied All dogs must wear an ID tag to the game and must be socialized enough to interact with people and other dogs. That being said, teams do their best to accommodate their special-needs fan-base. Fireworks are omitted to celebrate homeruns. Instead, pre-recorded bark tracks are played to mark the occasion. A veterinarian is usually in attendance in case of emergency. The San Francisco Giants held their annual “Dog Days of Summer” promotion for the 24th year in a row last year. It typically occurs in August to coincide with the consensus beginning of the “dog days” of summer. The promotion includes a pre-game parade and San Francisco Giants-branded leash. The Florida Marlins respect the free-spirited canine contingent by having no restrictions to one specific section – you will find them sniffing and socializing all over the ballpark. The Atlanta Braves promotion is known as “The Bark in the Park Event,” with tickets costing $25. Admission includes one dog and one human. Taking place annually since 2006, the promotion is one of the largest, attracting 5,200 fans and 2,600 dogs every year. 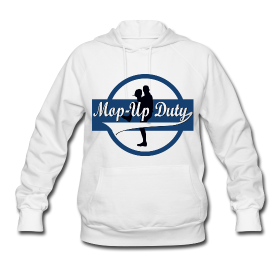 Besides being a fun day at the ballpark and an opportunity to bond with man’s best friend, proceeds for every “Dog Day” event go directly to the Society for the Prevention of Cruelty to Animals, Humane Society, or another dog-centric charity. I was checking about for a local dog day for my dog molly. Buffalo and Rochester are not running their usually dog day promotion this year.